A collection of compositions by Hilary de Vries, arranged and notated by Bill Taylor. The tunes are playable on a small wire-strung clarsach with 19 strings, having a range from G below Middle C up to treble D. The music is suitable for various levels of ability, from new player to intermediate. Background notes on the inspirations and ideas behind the music. Playing techniques and notation guide. 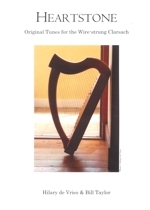 Hilary de Vries is a Scottish composer who writes mainly for harp, smallpipes and voice. She has collaborated with poets on music and song, and previously published a collection of tunes, The Buzzard & the Crow. Bill Taylor is a specialist in the performance of ancient harp music from Ireland, Scotland and Wales, and is one of very few players investigating these repertoires on medieval gut-strung harps, wire-strung clarsachs and Renaissance harps with buzzing bray pins. Bill teaches in the Highlands and works with Ardival Harps in Strathpeffer. He performs and records as a soloist and with several ensembles, including Canty, Graindelavoix, Quadrivium and Sinfonye.